Lucky Kitty Crew: Free Fun at Misp! If you don't have that kind of spare cash you can ride the bumper boats free in Misp, the home region of White's Works (SLurl), the store where I bought the rezzer. It was there that I test drove the product before buying it. I also considered the paddle boat and the jet ski, just two more of the many vehicles you can use for free. 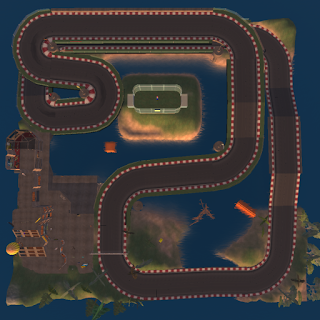 A large race track (see pic) fills the sim so you can try for free various motorcycles, scooters, and go karts, too. Other games and activities are available. Thank goodness the vehicles auto-delete when you are done riding them. While writing this post I crashed several, littering the sim with carnage.